Whipped Spoke Stitch is also known as whipped ring, raised spokes, ribbed spoke stitch, and ribbed stitch. 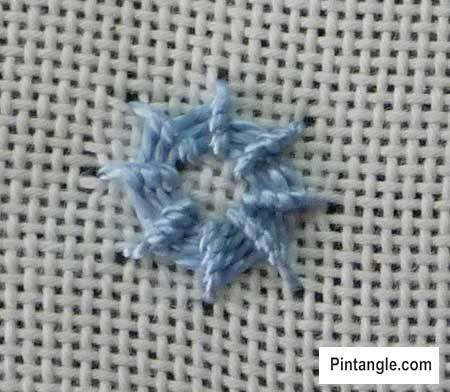 Most often you see this stitch worked in a circle with the foundation stitches referred to as spokes but you can work this stitch on a line of straight foundations stitches or use it to fill a shape. Whipped wheel stitch is a close relative as Whipped spoke Stitch involves laying down a series of spokes and whipping them. This produces a line or shape of ridged stitches. Use a blunt tapestry needle to avoid splitting the foundation stitches. Bring your thread up at the start of the foundation stitches and slide the needle under one thread and thread it through. Move back to the start and slide the needle under two threads. Note that the needle does not go through the fabric. For the rest of the line slide the needle under two threads, pull it through and move back one thread and once again slide the needle under two threads. Repeat this action, whipping each spoke as you progress across the shape. When you have finished the first row take your needle through the fabric and return to where you began and work a second until the rows fill the shape. Whipped spokes can be used alone as an accent stitch of colour or texture, or can fill a shape to produce a textured filling. The spokes can be arranged around a ring, in a line, in a fan shape or a free form shape. 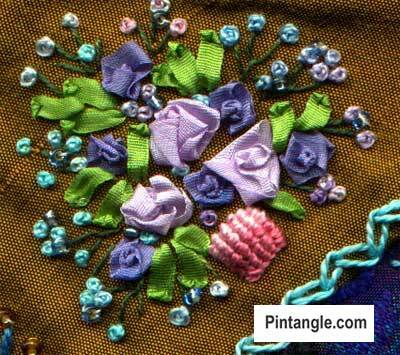 In this sample I used it to work a small basket for a bunch of silk ribbon flowers. It is 6 straight stitches whipped with a hand dyed cotton #5 perle thread. In this sample the shells are created by fanning out the foundations stitches into a fan shape. 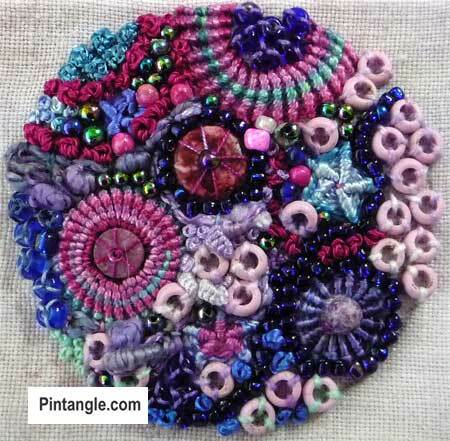 In contemporary embroidery working Whipped spoke stitch around beads and found objects creates interest. 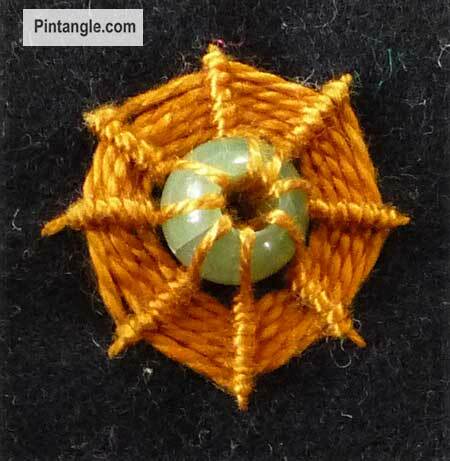 In this sample donut bead is secured to the fabric using 8 straight stitches which were then whipped. 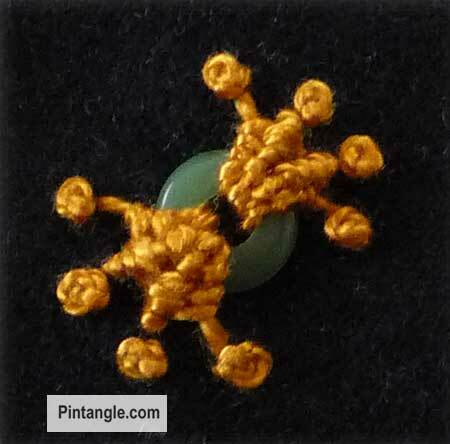 I added a french knot at the base of each straight stitch. The thread in cotton perle #5. You created a gorgeous piece here! That is a beautiful and versatile stitch, I like your samples, thanks Sharon. Thank You! 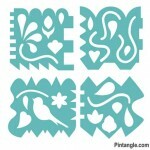 for not just showing us the stitch but for also showing various ways to use it. Your creativity is awesome. 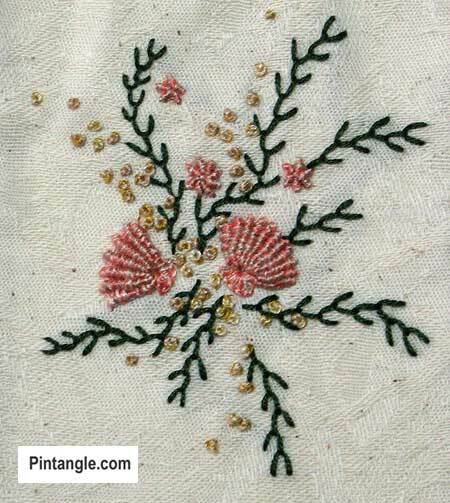 Wonderful ideas for this stitch. I had only ever used it to make the circle (rose) shape. Thanks for this posting.